Over the past 10 years Pat has entertained and informed hundreds of thousands of students – inspiring them to read and write. 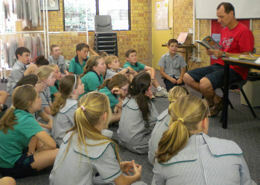 His author talks and writing workshops are fun and interactive. He is one of the few authors that can work with all year levels. To arrange a booking contact Speakers Ink or Booked Out. Thanks Andre and you’re right. Visiting schools and festivals to talk about book is very cool! Pat you visited my school on the 10/08/17 and I loved it! Please visit again. Hi Ben. Thanks for your nice words. What’s the question?